Aquamira is a two-part chemical treatment that can be repackaged in small, lightweight containers. It's very convenient, but because it is a consumable, you'll need to always be aware of how much is remaining. There are many chemical water treatment methods available. Some are iodine-based, others chlorine-based. Some are tablets that are dropped into the water and agitated, others are binary liquids that must be mixed, poured into water and then agitated. Most chemical purification methods have a temperature limit below which the chemical is not effective—sometimes as high as 40 degrees Fahrenheit. It's important that you carefully review the instructions. Chemicals also require time to work. Aquamira, a popular liquid chemical takes 15-30 minutes to effectively kill bacteria, and must be mixed in small cap for five minutes. Additionally, chemicals are a consumable that must be continually resupplied. Though light weight, I don't feel chemical treatments are ideal for a PCT thru hike. Steripens use UV light to kill pathogens and works well even in cold temperatures, but this model works best with the heavy Nalgene bottles. Other options are much lighter weight. Steripens work by emitting UV light at a wavelength we cannot see. When you stick this light in your water and agitate the liquid, the light scrambles the DNA of bacteria and Protozoa, killing them. It's like a really bad sunburn for bacteria. One benefit of optical methods is that they work even in frigid temperatures—provided your batteries survive the cold. However, batteries are a consumable and heavy, so I am not a fan of optical methods for the PCT. Both chemical and optical methods share an additional drawback: Prefiltering. 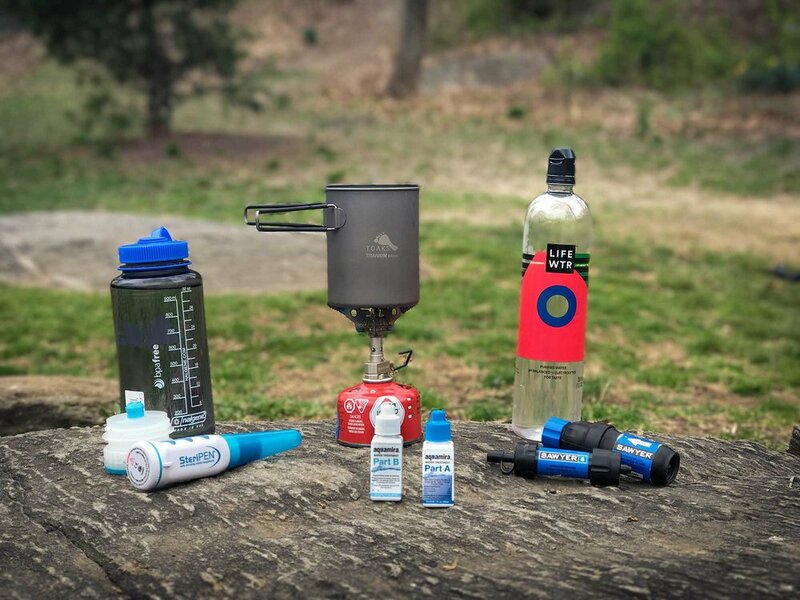 Because both methods neutralize contaminants rather than removing them, you may need to add a prefilter step to your routine unless you’re a fan of backcountry tea. You can often use your bandana to avoid adding single purpose gear. Yes, the same bandana you clean your feet with, and wipe condensation from your tent with, and bathe with, you get the idea. Nasty. I'll pass. Boiling water kills bacteria and viruses quite effectively. There is a fair degree of debate over how long the water must be boiled to kill pathogens. The best, and most convincing answer I’ve encountered is 1-3 minutes depending on how conservative you feel comfortable being. OffGrid has a great article on boiling times and the science behind it. As a point of reference, on a winter camping trip in 30 degree weather at 3240 feet, I used 11 ounces of MSR SuperFuel in a white gas stove system melting snow and bringing it to a boil for 3 minutes. The yield was approximately 6 liters of water. Granted on the PCT you likely won't be melting snow, but you can still see how quickly boiling eats up fuel. Boiling ties your ability to drink to a consumable. Don't even try to talk to me about cooking over fires. The PCT and the states it runs through can be so dry that fires are a perpetual threat. Try to avoid fires as much as possible. 2017 was an epic year for wildfires on the PCT, destroying beautiful forest and robbing many future generations of the opportunity to experience it. So, you may have guessed: Boiling water is not an great solution on the PCT. We are now down to filters: Membranes with tiny holes large enough to let water molecules through but not larger items like bacteria, dirt, and sediment. There are many models. Some have hoses and hand pumps. Some are compact and thread onto bladders or bottles, relying on gravity or squeezing a bottle or bladder to push water through the membrane. The primary drawback to filters is the risk of damage from freezing. If you’re in freezing conditions, you’ll need to keep the filter warm. I usually stash it in an interior pocket on a jacket I’m wearing. 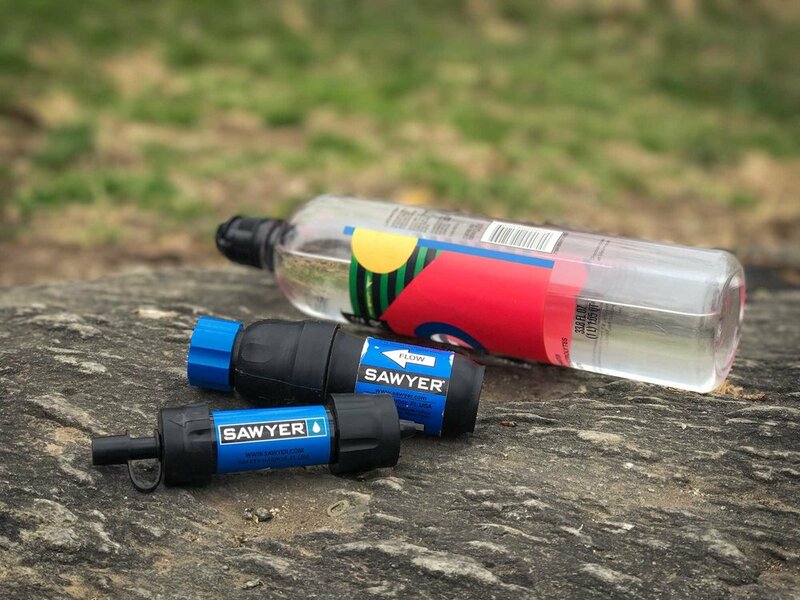 Sawyer Squeeze (Larger with faster flow rate lasts longer between cleanings) and Mini (Super light-weight, good for inline filtering with hydration bladder, but slow flow rate). The Sawyer Squeeze, which I used without issue, can filter 100,000 liters before the filter needs replacement and weighs only a couple ounces. The bladders that come with Sawyer filters are small and known for breaking. If you are keen on the Sawyer filter, I suggest you use Evernew bladders to achieve longer lifespan, larger storage capacity, and maintain compatible threading. Many hikers are getting excited about the Katahdyn Be Free, which I have yet to experience. That said, the concept is similar but the filter attaches to a flexible bladder. It has a drastically shorter lifespan but is much easier to clean. If you can balance the pros and cons, then it would be a viable option as well. Lastly, Platypus has their GravityWorks inline filter designed to be used their bladders and hose systems. It’s comes bundled with bladders in 2 and 4 liter sizes. If you are committed to their bladders you may want to look into their filter as well. Note at the time of writing, Platypus threads are not compatible with standard beverage industry threading. Sawyer filters in contrast, thread properly on standard 2 liter soda bottle-style threads. It’s proven. Many thru hikers have successfully used the Squeeze. It is bombproof, almost idiot-proof, simple and effective. It’s cheap. With a 100,000 liter lifespan, one of these should last longer than your thru hike. Not bad for Under $40! There you have it. While water treatment remains somewhat controversial with more aggressively ultralight crowd, I agree with and applaud you for deciding that the risk is not worth the reward. I’d love to know what you end up using on your thru hike and how it works out. Share your experiences in the comments below!